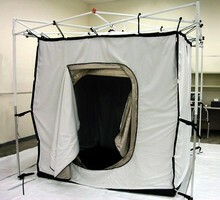 EMI Shielding Tents enable RF-tight testing. Custom-made to specification in 4-6 weeks with variety of options, SFi7003 EMI-excluding enclosure is available in tabletop to lab sizes. Portable solution enables on-site, on-demand pre-compliance troubleshooting, tuning, aligning, and testing of electronic devices in RF-free environment. Set-up with external EZ-up aluminum frames, tents are constructed with Nickel/Copper/Silver Ni/Ag material, which offers average 86 dB shielding from 20 MHz to 18 GHz. Pittsford, NY. SFi7003 EMI Shielding Tents are a new, unique range of economical, portable EMI- excluding enclosures. Available from tabletop to lab size, SFi7003 EMI Shielding Tents are the perfect lightweight, movable solution for on-site, on- demand pre-compliance testing. Simple to set up with external EZ-up aluminum frames, these RF test enclosures are intended for troubleshooting, tuning, aligning and testing electronic devices in an RF-free environment. With available internal dimensions from desktop to room size, SFi7003 is constructed from a durable, lightweight Nickel/Copper/Silver Ni/Ag material. Manufactured to military specifications, this flexible foil fabric offers an average 86dB shielding from 20MHz to 18 GHz. The special Ni/Ag material used eliminates any stress- cracking concerns, and also is not subject to galvanic corrosion. Up till now you had to invest in a very expensive RF screen room to do initial EMI testing and troubleshooting. But the economical and versatile SFi7003 allows you to economically maintain an RF-tight environment in your own facility. Optionally available are interior lighting, 2-door entry systems, clean-room capabilities, durable storage and transport bags, double-wall construction with or without insulators, fire-retardant properties, and many other options. All of the I/O connections and interfaces exit through a specially-wrapped port. Applications include: portable pre-compliance testing, screening equipment for R&D labs, computer rooms, emission-secure "radio- blind" military and government situations which can be instantly set-up in the field. SFi7003 EMI Tents are custom-made in 4 - 6 weeks to customer specification, and available from $3,000.00 from Saelig Co. Inc. Pittsford NY. info@saelig.com.